With the summer quickly approaching, the Spring weather brings the chance to get dressed up, throw on some shades and head out with your friends. The rooftop is the perfect place to unwind, day and night, chill out, and even sometimes grab a bite to eat. 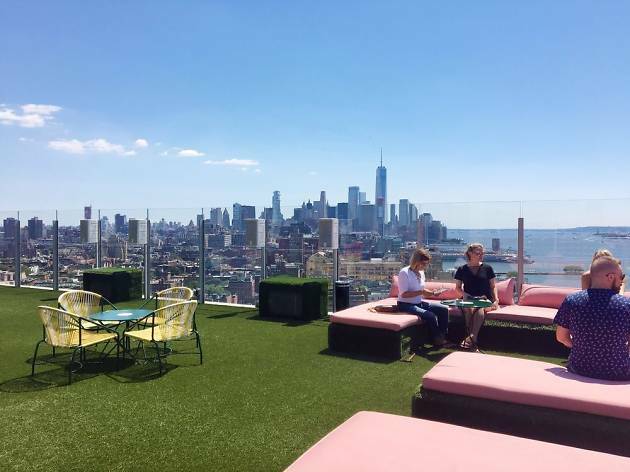 We’ve narrowed down 10 of the best rated rooftops that NYC has to offer this summer. We’ve even listed a Brooklyn option! Cheers, to good weather! Pod39’s hotel includes a colorful communal game room with table tennis and a fireplace, plus a stylish rooftop lounge and a seasonal bar. There's also a casual ground-floor restaurant. The lights give great aesthetic, perfect for a night time move. ﻿The Metropolitan Museum of Art of New York City, colloquially "the Met", is the largest art museum in the United States. With 6,953,927 visitors to its three locations in 2018, it was the third most visited art museum in the world. In the Summer, the MET offers free admission to the rooftop bar, making this the perfect day trip or pitstop through Central Park. It’s rather open with people of all ages, and sometimes exhibitions. Our biggest recommendation is to go during the week, when it’s less crowded. A chic penthouse bar & lounge featuring a rooftop garden & live music, plus global bites & brunch. Festive rooftop bar above Hotel Hugo featuring frozen drinks, tacos & panoramic river & city views. Rooftop cocktail bar at the Moxy Times Square with an amusement park theme, including mini-golf. Rooftop bar with panoramic skyline views from a terrace & glassed-in lounge plus craft cocktails. Bi-level locale with ingredient-driven Mexican cuisine plus cocktails highlighting mezcal & tequila. There's a disco, bar, (seasonal) plunge pool & crêperie, all on the roof of the Standard Hotel. On the roof of the Ink48 Hotel, this swanky bar features 360-degree city and Hudson River views.